And this monument commemorates some of the people who helped London survive: the firefighters – professionals and auxiliaries, men and women – the “heroes with grimy faces” as Winston Churchill called them. 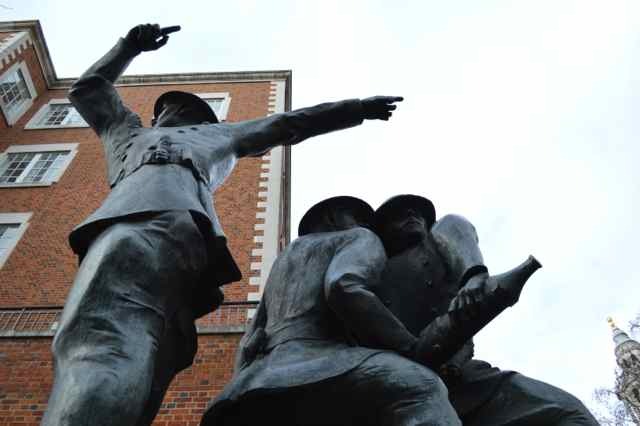 It’s by the sculptor John Mills – who also did the ‘Women at War’ memorial in Whitehall. It was originally the Blitz memorial, but is now the national firefighters’ memorial, commemorating all those who have died in active service in war and peacetime. There are nearly 1,000 names on it from WW2, and 1,200 or so from the post-war years. In the summer of 1940 Hitler had conquered France and the British army had retreated from Dunkirk. Over the skies of southern England the Battle of Britain raged, as the Luftwaffe tried to destroy the Royal Air Force as a prelude to invasion. But on 7 September 1940 the German strategy changed. Instead of bombing airfields nearly 1,000 planes attacked London – wave after wave of them coming across in broad daylight. Soon after the Germans switched to night time raids, but London was bombed every single day for 57 days. The raids continued through the winter, but there was a pause at Christmas. Then on the 29th/30th December the City of London suffered its most destructive night of bombing. The first bombers dropped high explosives, but the next wave dropped incendiaries – over 100,000 of them. The intention was to burn London, and it almost succeeded. Over 1500 fires were started, which came together to create three massive conflagrations. Buildings completely destroyed in the fire storm included 19 churches, 31 guild halls and all of Paternoster Row, just north of the Cathedral. Paternoster Row was the centre of the London publishing trade and an estimated 5 million books were lost in the fire. But St Paul’s survived. It had had a couple of near misses – a bomb destroyed the high altar in October and a massive bomb fell just near the entrance in September, but failed to go off – and on the night of 29th December an incendiary landed in the cathedral, but was put out by the St Paul’s fire watch, a group of volunteers who patrolled the church during raids to put out fires. The lead firefighter here indicates the cathedral, calling up support. But if you follow his hands they point to a carving on St Paul’s of a phoenix being reborn in the flames and the word ‘resurgam’ – “I shall rise again”. As appropriate for London after the Blitz as it was for the Great Fire. Great story! I was a firefighter for 40 years with the Metropolitan Fire Brigade – Melbourne, Australia, so when I saw this sculpture a few months ago when my wife and i were travelling in the U.K. I was genuinely moved after reading of the brave firefighters (men & women) who lost their lives trying to save life and property in London during the blitz.